Yamabisi outboard motors - a young brand, recently burst into the world of sea equipment, but has already managed to attract the attention of buyers competitive affordable prices, quality, reliability and a very attractive external data. The design department develops not only models, but also improves the equipment according to the product quality control system, which makes it possible to guarantee the product up to 2 years of operation. YAMABISI Outboard Engines is a subsidiary of the largest and oldest generator manufacturing plant, the corporation provides the company not only with financial assistance, but also provides serious technical support. YAMABISI is certified according to the ISO9001 international quality certification system, and also holds numerous awards and prizes for stable quality and excellent performance, and has CE, EPA and VCA certificates. The name “Yamabisi” is consonant with the famous brand and not by chance. Motors are a copy of the famous suspension, created by the same technology, but in the Middle Kingdom (China). As a result, for less money, you can buy a simple, reliable and productive unit. During the operation of these engines, many were convinced that China had long ago learned how to make high-quality equipment, even if using other people's technologies. 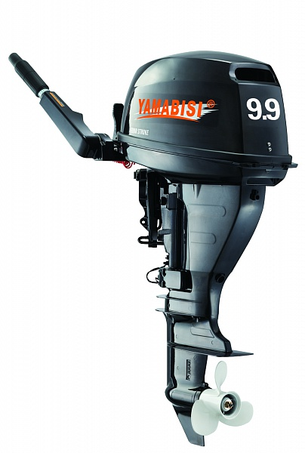 The model range of Yamabisi includes two and four-stroke engines with power from 2 to 40 hp. Each engine, starting with 4 hp, has a reverse gear, that is, there are three gears: forward, backward and neutral. There is a lifting mechanism for passing shallow waters. The suspension can be fixed at four different angles of inclination. A powerful cooling system will never allow the motor to overheat, therefore, it will serve for many seasons. Starting is performed by a manual starter, tiller control, gas adjustment is located on its handle. It is also convenient and easy to adjust the idle. Stylish modern look and rich equipment are another advantages of Yamabisi. Together with the engine you will receive a set of the most necessary spare parts: candles, gaskets, impeller for the cooling system. There is also a set of tools to replace all of this: a screwdriver and keys. Users are positive about the Yamabisi brand. The motors start easily, run smoothly throughout the rev range, are well built, reliable and safe. Even with intensive use, breakdowns are rare and are eliminated by buying and replacing simple parts. Yamabisi's four-stroke suspension pads are great for trolling, as they operate stably at low revs. Add here the compactness, low noise, light weight, low price and you get the perfect solution for the motorization of a hunting or fishing boat.